People in full time employment spend a significant amount of their time at the workplace. Many of us work for eight hours or more a day, fuelled by coffee or tea, which means there are plenty of visits to the bathroom! Having a comfortable and efficient washroom at work is vitally important, not only to providing comfort to your workforce but also for hygiene and productivity. The less time your employees are spending drying their hands under a slow, inefficient hand dryer, the better it is for productivity. However, the comfort of your employees should be your priority and Blow Motion commercial bathroom hand dryers focus on this. 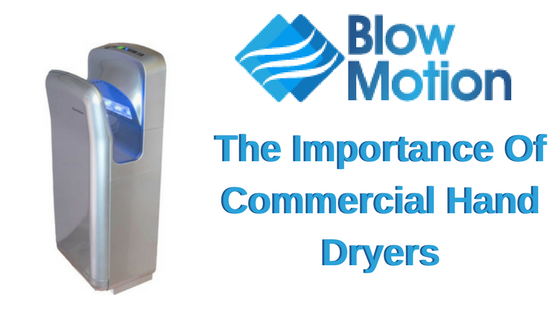 Here’s why our commercial hand dryers can be a valuable addition to your workplace washrooms. The workplace is where illnesses spread and multiply. You will spend most of your day with a team of people and maybe even the public and this close contact with people will increase your chances of getting colds and flus. The working environment is a place where germs thrive, particularly in the washroom, and although you may have a clean working area, your washroom could be slacking not just in terms of cleanliness but in how effective and hygienic the facilities are. These illnesses can be costly to your business when your workforce has to take time off. To prevent the spread of germs, all efforts should be put into providing hygienic washroom facilities. There should be a focus on hand hygiene in your workplace, simply washing hands is not enough, it’s all about the drying process. Effective hand drying ensures that any remaining germs and bacteria after washing are killed. 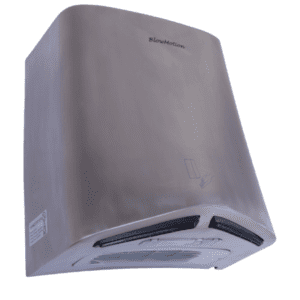 Many of our commercial hand dryers have HEPA filters installed inside them, such as the Ninja Jet Blade dryer. This HEPA filter cleans the air inside the machine so that only clean and antibacterial air is being blown onto the hands. Our hygienic commercial bathroom hand dryers are vital to improving the health of your workforce by stopping the spread of germs and bacteria. As an employer and business owner, cost and funding is no doubt important to you and cutting costs in any way possible can be a huge help to your business. As we’ve discussed however, hand dryers are a necessity in the workplace for hygiene reasons so there’s no avoiding this cost, but you can still minimise it! The one off cost of our commercial bathroom hand dryers start from as little as £115 and the running costs are some of the cheapest on the market! We have hand dryers that use as little energy as possible which means they are super cheap to run. For instance, our eco friendly MX2000S can dry around 100 pairs of hands for just 2p in electricity usage. This low energy usage means our commercial hand dryers are environmentally friendly which is perfect if you want to ensure your business isn’t leaving a large carbon footprint. We understand that time is money when it comes to business, so anything that can speed up the process of toilet breaks is a bonus. It’s time that slow and ineffective hand dryers become a thing of the past as their sluggishness can defeat their main purpose when many people give up on waiting and leave the bathroom with wet hands. For a commercial environment you need hand dryers that are super fast and leave hands completely dry in as a little time as possible. 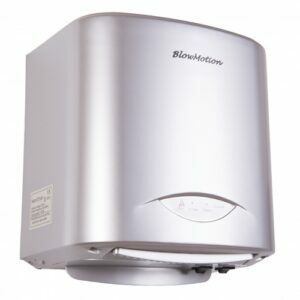 Blow Motion have a large variety of fast hand dryers which can dry hands in as little as 10 seconds or less! The Jet Blade V is particularly fast as its twin blade technology will blast water away from the hands in less than 10 seconds. When creating our commercial hand dryers we take various factors into consideration such as hygiene, cost, speed, and the effect on the environment as we understand that all of these factors are important to your business. 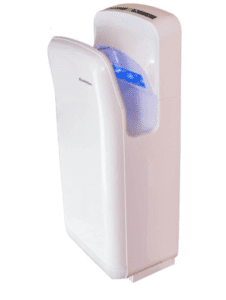 Browse through our website where you will find a whole host of fast, hygienic, low energy, and low cost hand dryers for commercial use. If you need any more information on our before buying one of our products, feel free to give our expert team a call on 0800 002 9678.